Entrance To Parliament, originally uploaded by bill kralovec. I snapped this photo yesterday outside of the Parliament Building in Belgrade. 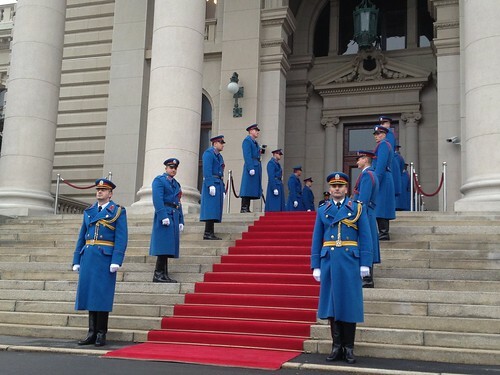 The red carpet and soldiers were out for the President’s speech on the National Day of Serbia, February 15 or in Serbian, it is called Dan Državnosti. The day commemorates the first Serbian Uprising against the Ottomans in 1804 and the first Serbian Constitution in 1835. It was a pretty subdued day in Belgrade. There were no fireworks or parades. The nationalist parties had a rally in the afternoon but it didn’t even make the news. I was expecting a bit more and I wonder why it is not that big of a deal. 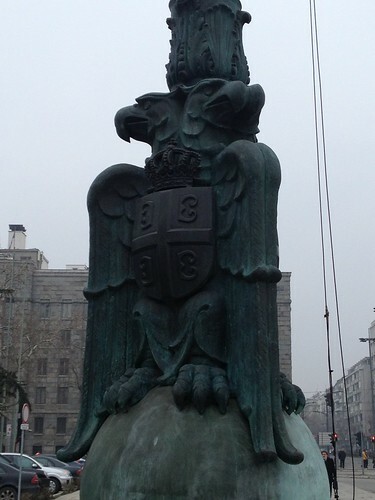 The double eagle and Serbian crest outside of parliament building on a cool and grey February day. People are disappointed with this “truncated” Serbia, there will be celebrations and fireworks when we return all Serbian lands under occupation: Kosovo, Metohija, Montenegro, Southern Serbia (now called FYROM), Bosnia, Herzegovina, Dalmatia, Kordun, Lika, Banija, West Syrmia, Slavonia and Baranja. Then we can celebrate our National Day properly!